It is a oval cake, the top was cut off to make the lid. I indented at the top to make the place to place the truffles in. 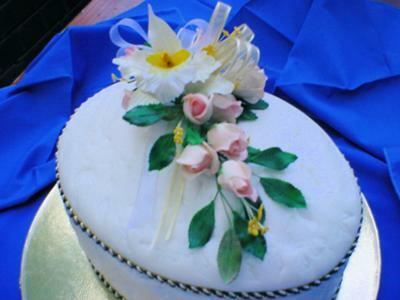 It was iced with rolled fondant and pressed with a flower mould to give the look of a lace. The lid was placed on a piece of cardboard and also covered with rolled fondant and pressed with the same mould. The top flowers on the lid are made out of sugar paste and arranged into a bouquet. Wow, what a beautiful cake. Very impressive, nice job and a great idea too!